When we learned that we would be spending this year in Asia, my daydreams quickly took me to China. The Great Wall. The Forbidden City. Tiananmen Square. Dragons and pandas. A mysterious land of enchantment and rich culture. More than 3,500 years of fascinating history. China immediately went to #1 on my bucket list for places to try and visit this year. 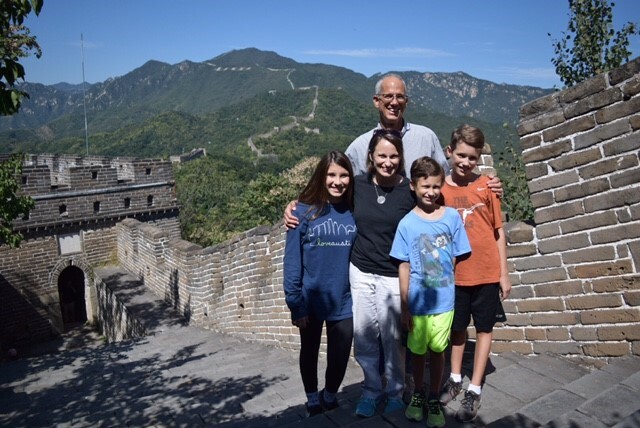 Last week, that vision -- that hope -- became a reality, and our family spent five unforgettable (and self-funded) days in Beijing. It is true that a picture can paint a thousand words. We have already shared some of our China pictures. For those who are not on Facebook, many of those pictures are also included here. But some stories resist being painted with an image. For those stories, words are the only paintbrush that will do. Here are a few of those stories, along with what we learned from them. 1. The right to have children is a precious freedom we have taken for granted. The people in China love children. They love their own children, and they also loved seeing our children. 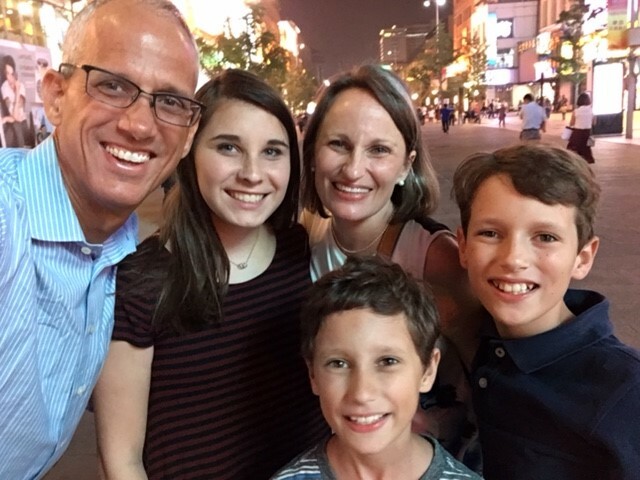 We had the good fortune of spending many hours interacting with ordinary people in China while visiting attractions, standing in lines, buying fruit, ordering meals, shopping for souvenirs, navigating our way through public transportation, etc. Despite language barriers, we succeeded in establishing some rudimentary level of communication with strangers, using hand gestures, facial expressions, and body language. The most frequent subject of these communications involved our kids. People were just as enchanted by our kids as we were with their country. People wanted to confirm that we actually had three children -- that these beautiful kids travelling with us were actually "ours." When we responded with a nod, a smile, pointing gestures, and three raised fingers, the response was always one of joy and wonder. Three children! An unimaginable blessing! People beamed at us and our kids. And we re-learned the hard truth we already "knew" intellectually -- that almost no one in China has been allowed to have this gift. The "one child policy" was enforced for 36 years, and has only been slightly relaxed within the last two years. Every parent we met had only one child. And they were amazed and excited to meet someone so blessed to have three. This year has been eye-opening for us in so many ways, illuminating just how fortunate we are, and how many things we have always taken for granted. This one immediately soared to # 1 on that ever-growing list. 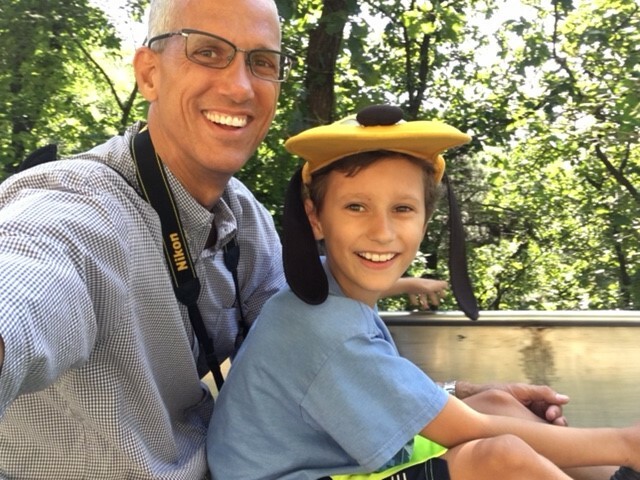 Two of our greatest blessings, at the Beijing Zoo. Another of our greatest blessings, at the "Bird's Nest" stadium in Olympic Park. 2. 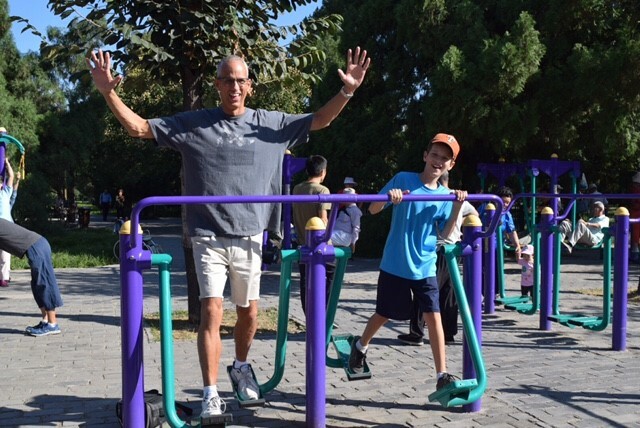 Americans in China attract serious attention. Our tour guide told us that many Chinese citizens have never laid eyes on a foreigner, encountering them for the first time when visiting a large city like Beijing. The truth of that admonition was quickly revealed. We often felt like celebrities walking around Beijing. It was common for us to find ourselves on the receiving end of stares and/or pointing. We were often approached with a request for a posed picture. David was our most photographed celebrity -- parents from China loved taking pictures of their (one/only) child with David. But he was not alone. It happened to all of us. Thais and I were once approached by a gentlemen who handed me his phone and asked me to take his picture with her. (I was not invited to be in the picture.) I gladly obliged, but then we both found ourselves stunned when he reached down to hold Thais' hand, as though they were a couple. To his delight, I took the picture anyway. (It was a sobering reminder for me: Thais has options. Need to stay on her good side.) We also occasionally noticed people sneaking in front of us to take a selfie with the tall American giant behind them, and then celebrating that they successfully nabbed the picture. It was a strange but entertaining feature throughout our week. One of the many beautiful kids whose parents insisted on a picture with David. 3. Line etiquette in China is a contact sport. We are accustomed to western norms for standing in line. You get your spot, and then you move forward in an orderly fashion, following those ahead when a gap in the line emerges. Everyone is entitled to a perimeter of at least a few inches of personal space, and care is taken not to push or bump into those around you. There is no "cutting," and the collective will of the crowd enforces this shared expectation. Well, things are done very differently in China. Here is how it works. If there is any air space between you and the person next to you, behind you, or in front of you, it will be very quickly filled. It may be filled when you are pushed into it (and into those surrounding you), or it may be filled by someone darting around and ahead of you. Any ill-advised choice to leave a gap of air space is an open invitation for others behind you to cut past you in line. And they do, with no hesitation. These were jarring revelations. 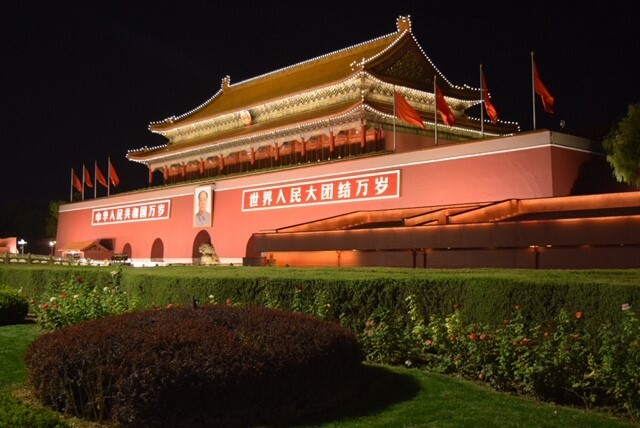 We stood in a very lengthy queue in Tiananmen Square to enter the mausoleum for Chairman Mao Tse-Tung. The square was filled with switchback lines snaking across concrete, with metal barricades blocking off the queue on both sides. The line was just wide enough for four people standing shoulder to shoulder. In keeping with western line etiquette, we assumed our positions with one row of three Kildays, and another row of two behind, leaving a generous amount of personal space on all sides. Within seconds, those entering the line behind us zoomed past, laughing at our mistakes and leaving us in their dust. We remained at the tail end of the line, as we continued to watch newcomers treat us like nothing more than a a "line entrance" signpost. We quickly regrouped and made a plan. We stood shoulder to shoulder in a tight row of four, with one serving as a scout to warn of incoming line-busters. This worked well on the long straightaway. But as we made our first turn, an opening was created on the outside corner. We had two dozen opportunistic line-busters run past, while laughing, before we could move forward to close the inadvertent floodgate. This happened again at the next turn. Our family looked like Tennessee's run defense against Georgia Tech, but that's another story. We made a key halftime adjustment. When we approached the next turn, our row of four expanded to five, locking arms for an impenetrable barrier through the turn. This completely stymied the opposition, and our defense held firm. It became a competitive contact sport from that point forward. We gained some respect and admiration from those in line with us, as we adapted nicely to our new cultural environment and held firmly to our place in line. But there was this one very petite, older lady behind us who was determined to get through our American line of defense. (I called her the "evil grandma.") She attacked us at every turn, trying to sneak under, around, or through our locked arms. It was a fierce, two-hour battle. One time, she tried the battering ram approach, with a punishing body check between Thais and me. Her attempt fell short, and our bruised arms kept her behind us. By this time the people in front of us in line were cheering us on, as we celebrated our mounting victories. The mausoleum was probably not worth the long wait in line, but I'm glad we had this unique experience and the family bonding time of building our very own great wall in China. Hooray Team Kilday! At the north "gate" of Tiananmen Square -- the "Gate of Heavenly Peace." Inside the Forbidden City, the Chinese imperial palace for nearly 500 years. 4. Human ingenuity is alive and well in China. There is no private ownership of land in China, but we learned about an interesting quirk showing how resilient the human spirit can be in claiming rights that we in the U.S. like to call "inalienable." All land in China is owned by the government. Land is made available for "homeowners" under a non-transferable 70-year lease, with the land reverting to the government upon death of the homeowner or at the conclusion of the 70 years, whichever comes first. These laws do not allow a family home to be passed down to the younger generation -- an issue that has only recently caused widespread consternation. As Chinese citizens have looked for ways around this restriction, a solution has emerged. It's complicated, and a little strange, but this is absolutely brilliant. An aging couple in this situation can take the following steps. First, legally get divorced, leaving title to the 70-year lease in the name of the husband. Second, have your child (in this example, a son) legally get divorced from his wife. Now, here comes the strange and awkward part -- third, have the father legally marry his former daughter-in-law, placing the lease in the name of both. Fourth, have the father and former daughter-in-law legally divorce, leaving the lease in her name. Fifth and Sixth, the two original couples re-marry, with the lease now in the name of both the son and the daughter-in-law. Three divorces and three marriages later, the original goal is accomplished. While I vastly prefer just treating private ownership of property as a legally protected right, I applaud and admire the ingenuity of the citizens of China for finding a way of claiming these rights over the protestations of their government. The Hall of Prayer for Good Harvests, at the Temple of Heaven. 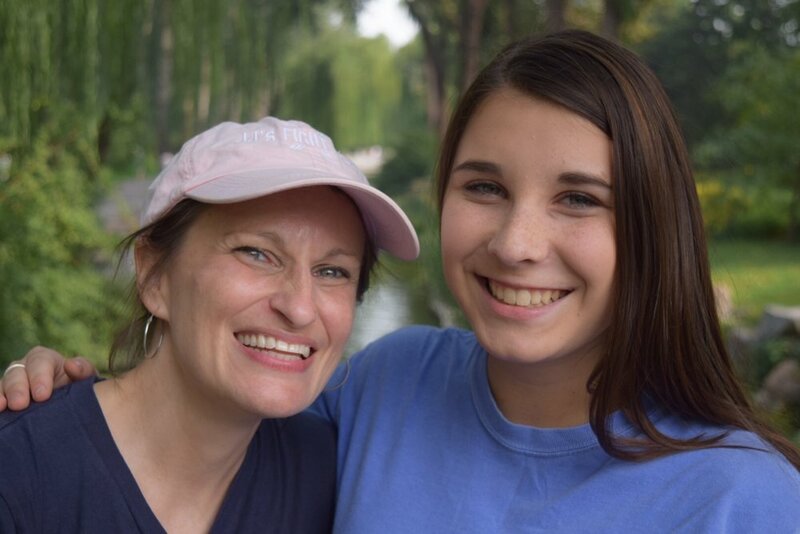 A happy Mom and daughter, at the Beijing Zoo. At the Mutianyu section of the Great Wall, the way down is on a totally fun toboggan sled. David and I had a blast! Our week in China was unforgettable, awe-inspiring, educational, and just delightful. Thank you for joining us for this amazing part of our journey! Yes, that's us. And yes, we are absolutely acing our way through the subway system in Beijing. 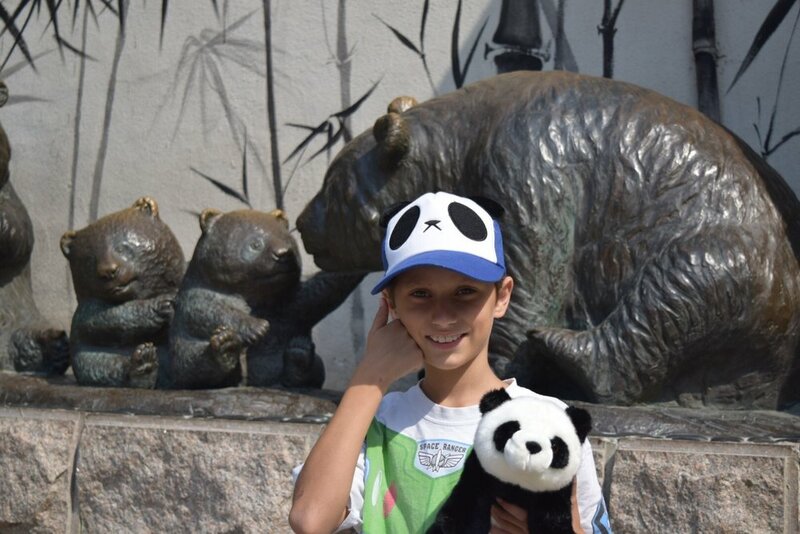 David loved the pandas at the Beijing Zoo! 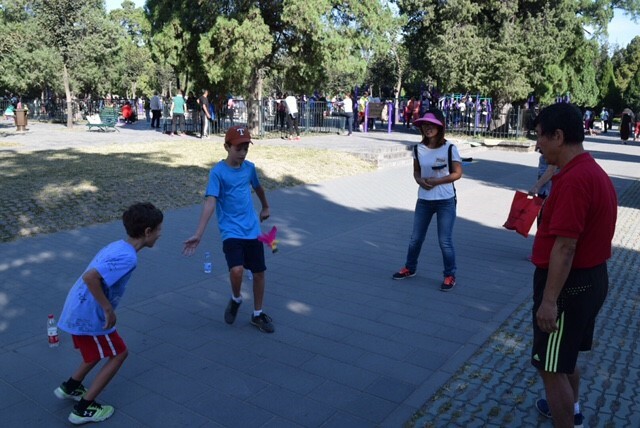 The public park at the Temple of Heaven. We learned how to play with a jianzi, which is China's version of a hackey sack, with feathers sticking out from the top. The Gate of Heavenly Peace is especially stunning at night. Our last night in Beijing, on Wangfujing Street after a delicious Peking Duck feast!